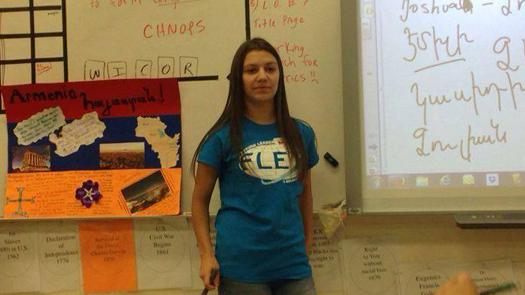 Armenian high school student Tatev sporting her FLEX t-shirt in school. Is it possible that a passion for seeking out international understanding is genetic? For the Gishyan/Grigoryan family of Armenia, participation in a U.S. government-sponsored exchange program has certainly become a family affair. Three generations of this family have traveled to the United States on an exchange program, each serving as a role model to the successive generation. Karen Gishyan is a 2013-2014 Future Leaders Exchange (FLEX) alumnus who spent his exchange year in Defiance, Ohio studying at Tinora High School. Karen is now studying Business at the American University of Armenia and is actively involved in different projects and programs. In 2014-15, Karen served as the FLEX city representative in Gyumri, and within ten months organized more than twelve events for FLEX alumni and community members. In recognition for his work commitment, he was selected as “Best FLEX City Representative” in May 2015. 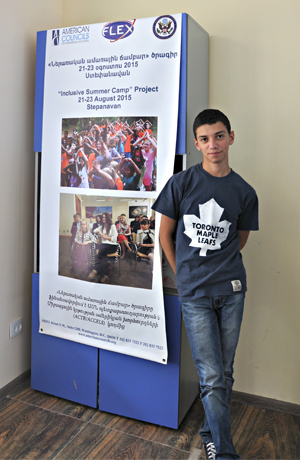 In the summer of 2015, Karen helped to implement the “Inclusive Sumer Camp” project for 21 schoolchildren with and without disabilities and for socially needy families as part of his FLEX alumni grant project. Karen has now been invited by American Councils to attend the Workshop for Youth Leaders in English Teaching (WYLET) in Washington, DC taking place March 30 – April 9, 2016. Karen will participate as a teacher assistant because of his demonstrated commitment to English language learning initiatives as an alumnus of the program. But Karen is not the only prominent FLEX participant in the family: his sister Tatev is currently a FLEX fellow who has been invited to participate in the Civic Education Workshop in Washington, DC taking place March 13-19, 2016. This workshop is a unique program that provides 100 FLEX and 15 American Serbia and Montenegro Youth Leadership Exchange (A-SMYLE) participants from different countries with a deeper understanding of the American system of government, civic participation, and basic democratic principles. The workshop also advances leadership skill development by cultivating critical thinking, public speaking, teambuilding, and goal setting. Who could have inspired these two incredible FLEX alumni? Perhaps their mother who participated in the Junior Faculty Development Program (JFDP) or their grandmother participated in the Teaching Excellence and Achievement (TEA) program!